The quote is from an article in The Writer’s Almanac, published daily on the Internet by americanpublicmedia.org. As a coda to this virtual tour, I present a famous fictional account of emigrants from Sweden to the Minnesota territory. 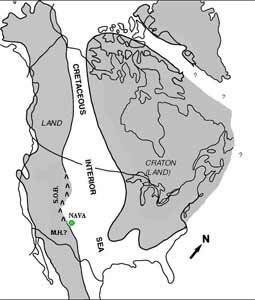 Until around 70 million years ago, the interior of North America was flooded by an immense ocean that connected the present day Gulf of Mexico with the Arctic Ocean. As North America drifted farther west from its prior attachment to Europe and Africa, it encountered a oceanic plate on its western edge that caused the crust beneath this seaway to buckle up. This was the start of the Rocky Mountains as we know them today. The Rocky Mountains, stretching from Canada through central New Mexico, began rising 70 Million years ago and continued, rapidly as geologists see things, for a period of 30 million years. They stopped growing 40 million years ago and erosion began to wear them down. Clay, sand, and silt were washed down the mountains by rains, creating The Great Plains and the North Dakota Badlands. At this time the climate of western North Dakota was subtropical and crocodiles were present in the lakes and rivers. The current ice age started around 2.6 million years ago, centering in huge ice sheets over North America and Eurasia. Glaciers, advancing and retreating several times generally from the north, scoured the land, creating river valleys and other north-south features, such as “coteaus”—hilly uplands between the valleys, e.g., the Turtle Mountains in the north and the Missouri Coteau running diagonally across the center of the state from the northwest. 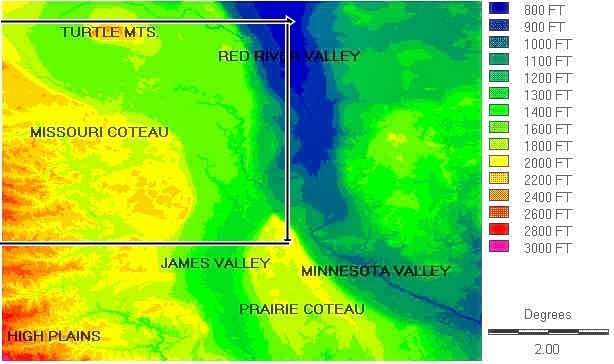 The major rivers of North Dakota are The Red River of the North, which forms the boundary with Minnesota to the East, and the Missouri River which roughly encompasses the southwest quadrant of the state. Rugby, located in the north-central part of the state, is the geographic center of North America. In the years between 1100 and 1300 AD, tribes migrated from the east, including the Hidatsa and Mandan. They built extensive villages, developed agriculture and hunted and traded over a large area. By the 1600s, the Cheyenne had become temporary residents of the area, following the great herds of bison. They, along with the Lakota Sioux and Assiniboine, profited immensely by domesticating wild horses of Spanish origin. At the time of the Europeans’ incursions into the region in the early 1800s, major native groups included the following: the Mandan, Hidatsa and Arikara along the Missouri River; the Ntonai Sioux in present-day southeastern North Dakota; the Lakota, the most numerous and powerful of the tribes, in the southwest; the Ojibwa in the northeast and the Assiniboine in the northwest. (Source). In searching for a hypothetical “River of the West” connecting Hudson Bay to the Pacific, The French Canadian Pierre Gaultier de Varennes, sieur de La Vérendrye located the Missouri River in Mandan country, probably near the modern New Town, North Dakota about 70 miles east of the Montana border (October 1738). In 1762, near the close of the French and Indian War, France granted Spain the area known as Louisiana. The major European influence at the turn of the century was Canadian, primarily through the activities of the North West Company. David Thompson of the Company explored north central North Dakota in 1797 and drew maps of his findings. The region was ceded back to France in 1800. The rapid territorial exchange was completed in 1803, when France sold the area to the fledgling United States in what is known as the Louisiana Purchase. This acquisition provided about two-thirds of the territory that today is North Dakota; the remaining portion was obtain from Britain in the Convention of 1818. (Source). By the 1840s, two major changes were occurring. First, the number of fur-bearing animals was being exhausted, reducing a major source of income for many of the tribes. Second, surrounding areas were developing rapidly; Iowa achieved statehood in 1846 and Minnesota gained separate territorial status in 1849. Spillover from these areas increased the non-native population of the Dakota regions, which aggravated a number of the Indian tribes that resented incursions onto their homelands. During the 1850s, land companies enticed settlers. Sioux Falls was founded in 1856 and over the next few years Yankton, Bon Homme and Vermillion followed. The increased population led to the establishment of the Dakota Territory immediately before Abraham Lincoln took office in March 1861. Most settlers came to North Dakota for free or inexpensive land and the chance to farm. Between 1879 and 1886 over 100,000 immigrants entered northern Dakota territory. The second massive movement into the state was between 1898 and 1915 when more than 250,000 persons arrived. While some of the earliest settlers came by ox-drawn wagons, stagecoaches, or steamboats, the vast majority came on the railroad. Both the Northern Pacific and Great Northern railroads advertised Dakota in Europe, promoting people to take the railroad to North Dakota and farm the rich land there. Most new settlers grew wheat, but did not have large farms. They either bought their land from the railroad or they homesteaded federal land. Homesteading involved living on and improving 160 acres of land for a number of years, after which the settlers got the land for free. They could receive an additional 160 acres of land by planting and maintaining trees on the prairie. Large-scale farming occurred in eastern North Dakota from about 1875 to 1890, when investors from the eastern United States purchased huge tracts of rich Red River Valley land. Much of it was acquired from the Northern Pacific Railway and operated as large farms growing “No. 1 Hard” wheat. These farms ranged in size from 3,000 to 65,000 acres. The farms earned such tremendous profits that they became known across the United States as bonanza farms. 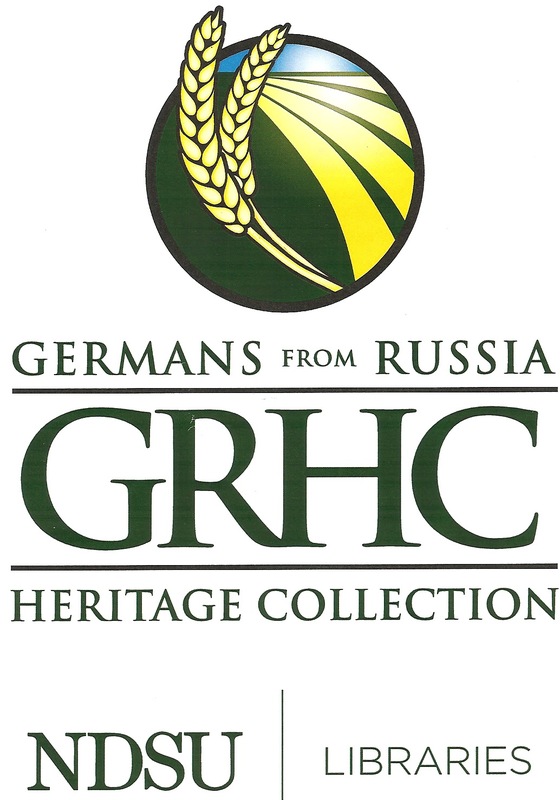 Thousands of Germans emigrated to a newly expanded Russia beginning in the mid-1700s and extending into the 1880s. Disenchantment developed within the numerous German colonies beginning in the 1870s when the Russian government revoked many privileges and subjected the males to conscription, the children to the Russian language in schools, and all colonies to Russian rule. They were also upset by a shortage of new land for sons. Coincidentally free land was available in the United States and heavy German-Russian emigration began in the 1880s. Approximately 120,000 German-Russian immigrants entered the United States to settle in various parts of the Great Plains before World War I. Most of these were Protestants, but a smaller number of Catholics, mainly from the Black Sea area, also emigrated. These largely settled in North Dakota where large expanses of unimproved land were available for homesteading in the counties immediately to the east of the Missouri River and west of the river on the Missouri Plateau. The Dickinson, North Dakota area was primarily settled by German-Russian Catholics from Beresina in Bessarabia in the 1890s. Many of those arriving in the early 1900s settled south of Dickinson in the vicinity of Schoenfeld, later called Schefield. German-Russian homesteading continued to World War I when they comprised the largest immigrant population in western North Dakota. The first Norwegians arrived in the Dakotas as early as 1859, shortly after the treaty with the Yankton Sioux was signed July 10, 1859. It took another ten years before the greater influx of Norwegians took place. 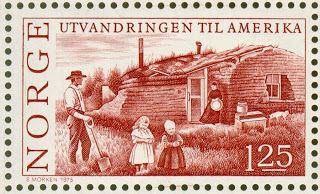 The Norwegian immigrants began arriving in North Dakota in the 1870s. They settled mainly in the eastern and northern parts of the state, but today they’re found everywhere in the state. Because of the lack of farmland in Norway, the Norwegian immigrants sought the wonderful fertile farmland of North Dakota. Some of the immigrants had spent a few years in other states before they finally arrived in North Dakota. In 1880 the census recorded 8,814 Norwegians in North Dakota, and by 1900 there were 73,744. The towns of Columbus and Larson is approximately 100% Norwegian, founded by Columbus Larsson in 1906 and 1907. It had 672 inhabitants in 1960, while it’s just 133 in 2010. Although these towns have a strong Norwegian heritage, none of the inhabitants speak Norwegian. Like the trend for the rest of North Dakotans, Norwegians are moving out of the rural areas. Settlers from Telemark, Norway found their way to most of the major settlements in North Dakota in the late 1870s and early 1880s. In 1880, a band of people from Telemark, settled in the area of what is now Bue (named for the settlers’ Norwegian home in Bø, Telemark) in Nelson County. Their main cash crop was wheat, and they soon found that raising cattle was also quite lucrative. The main markets were in Valley City and Grand Forks. 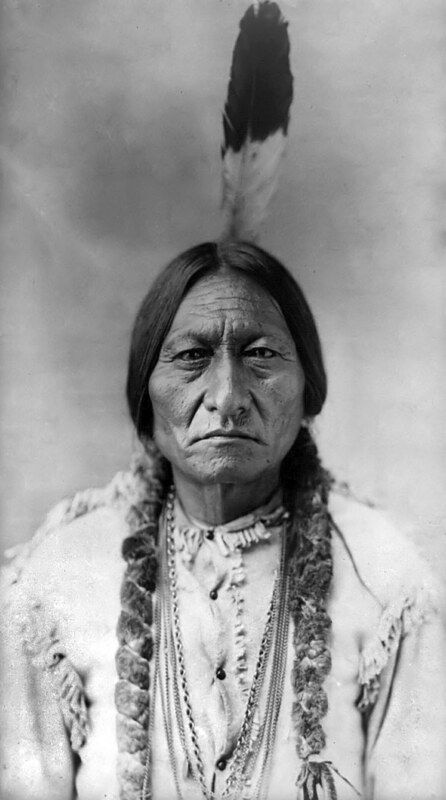 Chief Sitting Bull was born in what is now North Dakota. During the Civil War he orchestrated raids on settlers who had encroached on the traditional territories of the Sioux Nation. His refusal to return to the reservation in 1876 led to the campaign know as “Custer’s Last Stand” in which General George Armstrong Custer and his 7th Cavalry were wiped out at the Battle of Little Big Horn. Relations between the Indians and the occasional explorers and settlers were generally peaceful in the early decades of the 19th century. The fur trade changed native life, bringing guns, metal implements and cloth. Contact with the outsoders also introduced disease. 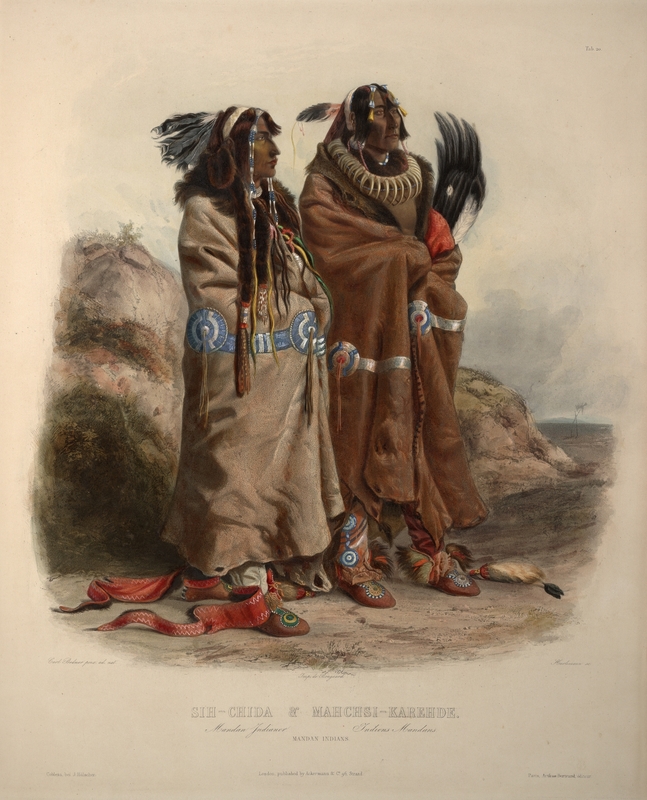 The Mandan and Hidatsa in particular were hit hard by smallpox in 1837. But as the settlers increased pressure on the lands, problems arose between the natives and newcomers. Indian “problems” dissuaded many settlers from considering the Dakotas as a possible home. In 1862, the Santee Dakota in Minnesota had staged an uprising and then fled into the Dakota Territory. They were pursued by the U.S. Army, which began to construct a series of forts across the territory to provide protection for settlers and travelers. The presence of the army also served to stir up tensions among the resident tribes, the Sioux in particular. Some stability was brought by the Fort Laramie Treaty of 1868 in which the U.S. pledged to keep settlers out of specified areas. In return, some of the Sioux, but not all, agreed to remain on reservations west of the Missouri River. The coming of the railroads and the discovery of gold, however, would again ignite warfare in the region. After signing treaties with the United States government from the 1850s to the 1870s, North Dakota Native Americans were placed on several reservations. Many tribal members remain on these reservations still today. 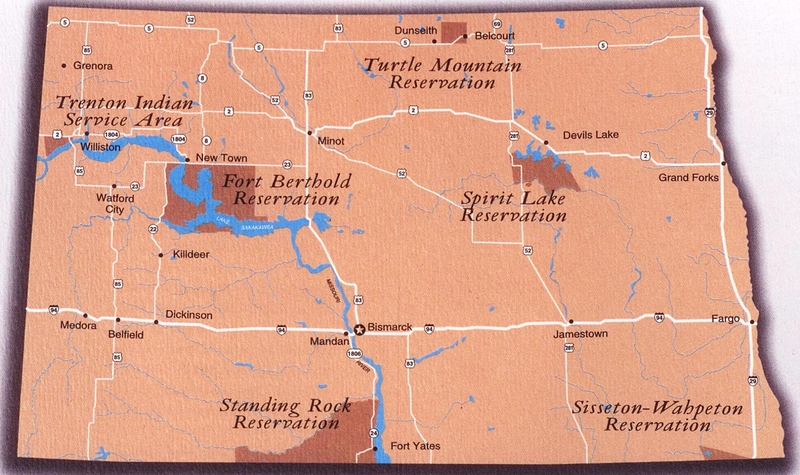 There are five reservations in North Dakota, two of which occupy land in both South and North Dakota. The Spirit Lake Nation (Devils Lake Sioux) is located at Devils Lake, in east central North Dakota. The Fort Berthold Reservation is home to the Three Affiliated Tribes (Arikara, Hidatsa, and Mandan), and lies in the west-central part of the state along the Missouri River. The Standing Rock Reservation (Standing Rock Sioux) straddles both North and South Dakota and is about forty miles south of Bismarck, North Dakota. 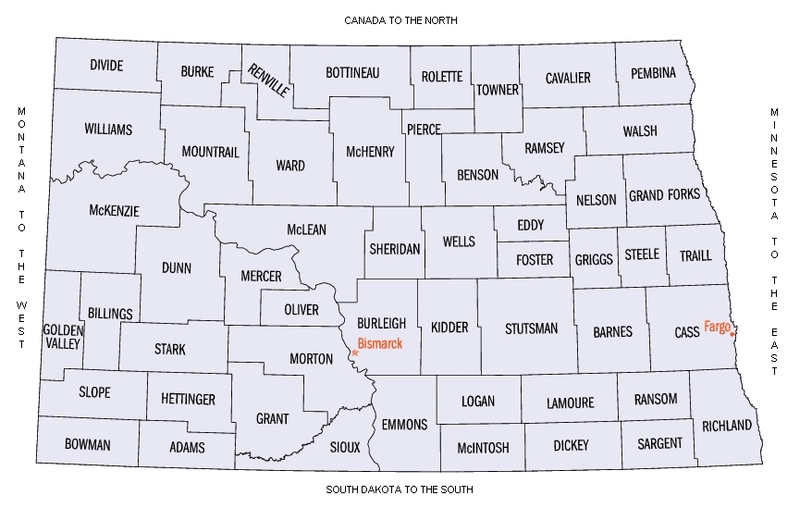 The Turtle Mountain Reservation (Chippewa and Metis) is the northernmost reservation, just below Canada in north central North Dakota. The Sisseton Reservation (Sioux) is predominantly in South Dakota, with just the northernmost edge in southeastern North Dakota. Using a geology-based assessment methodology, the U.S. Geological Survey estimated mean undiscovered volumes of 3.65 billion barrels of oil, 1.85 trillion cubic feet of associated/dissolved natural gas, and 148 million barrels of natural gas liquids in the Bakken Shale Formation of the Williston Basin Province, Montana and North Dakota. (Source). Modern land survey is based largely on proposals developed by Thomas Jefferson in 1784. It is based on a series of rectangular surveys, adjusted for the curvature of the Earth. The badlands are a hilly landscape, but on approaching them, you look down on the hills from above, not up at them. From the rim of the “breaks,” as the descent into the badlands is called, you see a strip of sparsely wooded ridges, bluffs, buttes, and pinnacles. Behind, a rolling plain, broken only by an occasional butte, stretches away to the horizon. The Sioux Indians, one of the tribes that inhabited the area when European settlers arrived, referred to the badlands as “makosika” (“land bad”). Early French explorers translated this and added to it, referring to “les mauvais terrers a’ traverser” (“bad land to travel across”). Layers of sedimentary rock are found near Dickinson, where badlands are carved from the Oligocene Brule and Chadron Formations. These beds are notable for their abundant mammal fossils. Other areas of badlands topography include exposures of the Eocene Golden Valley Formation, also near Dickinson, and exposures of the Cretaceous Hell Creek Formation. The Emigrants and its sequels, Unto a Good Land, The Settlers and The Last Letter Home, is the epic story of peasant farmers in Sweden who found they could not make progress and would continue to live on the cusp of total poverty. As with so many others from the Scandinavian countries, they gather family and friends to take the monumental step of making a fresh start by emigrating to the United States of America. The books depict their lives in Sweden, the motives for the huge decision they each made, and their tough sea voyage across the Atlantic, and generally their hardship and struggle. Vilhelm Moberg did considerable research into the subject and the result sheds important light on the exodus from Scandinavia in general and Sweden in particular. 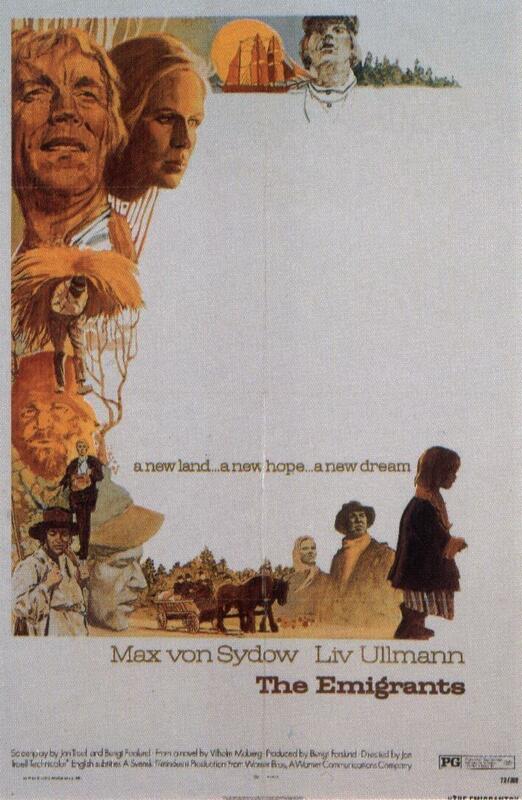 The saga was made into a movie starring Max von Sydow, and Liv Ullmann. This entry was posted in Demography, Geography, History and tagged Bakken Formation, Chadron Formation, Cretaceous Hell Creek Formation, Dakota Territory, Eocene Golden Valley Formation, Missouri Coteau, Missouri River, Oligocene Brule Formation, The Inland Sea. Bookmark the permalink. Hi Steve, Thanks for the read and the comment. I have seen articles on ND’s “boom” and it makes me feel good that I identified the source in the article: The Bakken Formation. I’ll read the NYT’s offering too.